You know, if the truth were known I have a perfect passion for the island where I was born. Well, in the early morning there I always remember feeling that this little island has dipped back into the dark blue sea during the night only to rise again at gleam of day, all hung with bright spangles and glittering drops . . . I tried to catch that moment . . . I tried to lift that mist from my people and let them be seen and then to hide them again. I am returning to Genova in July and already my head has begun to fill with what I would like to achieve while there this time. That city brings me alive in a way that no other place has so far. Perhaps Istanbul came close but Genova has everything ... in just the right proportions. It is imperfectly perfect for me. Genova, once known as La Superba, is an ancient Italian city (at least 2,000 years in the making), nestled in the arms of hills that are topped by ancient fortresses. And at the feet of the city you have Ligurian Sea. The first time I saw that sea tears filled my eyes. It had been a long time since I had been anyplace where the sea looked like home. I was out at Nervi, photographing a Genovese family, and suddenly I was overcome by this strange sense of being back in a place that was completely familiar. I have been thinking about things and have this idea that if you ever leave the country you were born in and move someplace else, far away, then eventually the idea of returning home can become as strange or as foreign as living in another country. And so you move countries and become 'the other', living amongst people who are 'the other' to you. But when you go home you realise you have become something else there as well. And so my place on the edge of lives and cultures is confirmed, probably for life. That said, there is something else that happens out here. I love people. I love when they invite me into their worlds. In Istanbul there were Turkish families I adored because they took care of me when I lived alone in their city. That experience of being a guest, of being invited inside, to be a part of this celebration or that, here in Belgium, in Berlin during those months spent living and working there. Cairo. Naples. France. Italy. It's those insider journeys that make this lifestyle of mine so very very worthwhile. Lately I've been reading a series of biographies and fictions about New Zealand author, Katherine Mansfield ... searching for clues I think. Something about her story speaks to me. She left NZ in 1908 aged 20. By 1923, she was dead from TB but not before she had revolutionised the 20th Century English short story. She was a part of the English literary scene at the time and yet very much the colonial from the Antipodes. Her masterpieces—the long stories ‘At the Bay’ and ‘Prelude’—are lovingly detailed recreations of a New Zealand childhood, reports from the fringe—the edge of the world as she felt it to be. She wrote as if she’d stayed. Of course these luminous re-imaginings are lit with the affection and nostalgia of the expatriate. They would not exist without their author’s estrangement from the scenes and places and people she describes. They are set in a New Zealand of the mind, composed at the edge of Mansfield’s memory. I'm curious about her because I relate to her on so many levels. I feel like reading her story might tell me more about mine. I yearn for home. Adore it, am passionate about it and yet ... could I go back and live there again? I really don't know anymore. 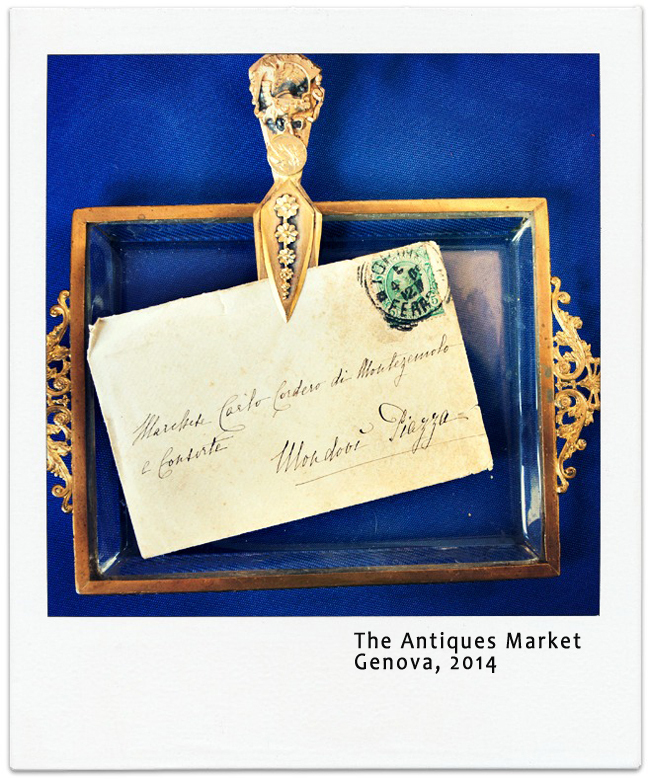 Ahhh but all of this when really I came to post a photograph I took at the antiques market in Genova, back in May.